A building labourer, who was found to be more than 40 times the drug-driving limit when pulled over by police, has been disqualified from driving for four years. Christopher Laver, 29, was one of 150 motorists arrested during Surrey and Sussex Police’s month long crackdown on drink and drug-drivers in June. A total of 91 of the offenders have been convicted so far. Laver was pulled over by officers in Brighton Road, Lancing, at about 2am on 17 June due to his erratic driving, police said. Following a roadside drug test, he was arrested and charged with driving with 40mcg of cocaine, 800mcg of benzoylecgonine – the main metabolite of cocaine – and 417mcg of ecstasy per litre of blood in his system, according to police. 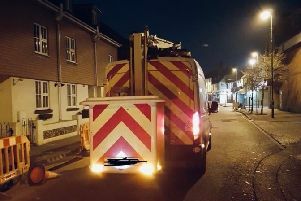 At Worthing Magistrates’ Court on 3 October, the 29-year-old building labourer, of Dellfield Close, Portsmouth, Hampshire, was disqualified from driving for 48 months. Among the other offenders was Jacek Musial, 41, unemployed, of Joyce Close, Wick. He was arrested in Grevats Lane, Climping, on 23 June and charged with driving with 111mcg of alcohol per 100ml of breath in his system, more than three times the limit. At Worthing Magistrates’ Court on 22 August, he was disqualified from driving for 24 months and given a 16-week community order. He was also ordered to pay £85 costs and a £85 victim surcharge. Warren Winton, 53, a warehouseman, of Yew Tree Close, Lancing, was arrested in Pavilion Road, Worthing, on 5 June, and charged with driving with 38mcg of cocaine per litre of blood and more than 800mcg of benzoylecgonine per litre of blood in his system, police said. At Worthing Magistrates’ Court on 22 September, he was disqualified from driving for 12 months. Alexander Kembrey, 28, a fence erector, of Hormare Crescent, Storrington, who was arrested in Mill Road, Steyning, on 14 June, and charged with driving with 185mcg of cocaine per litre of blood in his system, more than 800mcg of benzoylecgonine per litre of blood in his system, and two counts of possession of an offensive weapon (a knuckle duster), police said. At Crawley Magistrates’ Court on 18 August, he was disqualified from driving for 24 months. He was also sentenced to a 12-month community order, and ordered to pay £85 costs and a £85 victim surcharge. Andrejs Truselis, 41, a builder, of Vanbrugh Close, Crawley, was arrested in Dorsten Place, Crawley, on 1 July and charged with failing to provide a specimen of breath for analysis. At Crawley Magistrates’ Court on 18 September, he was disqualified from driving for 18 months. He was also sentenced to a 12 month community order, and ordered to carry out 80 hours of unpaid work, and pay £135 costs and a £85 victim surcharge. In Brighton, a woman was more than twice the drink-drive limit when she crashed and overturned her car. Cheryl Graddon had her nine-year-old son in the back of her Peugeot 206, and also admitted to driving with no licence and no insurance when the incident occurred. It happened in Plymouth Avenue, Brighton, at about 10.48pm on 7 June – during Surrey and Sussex Police’s summer crackdown on drink and drug-drivers. On police arrival, it was discovered the Peugeot had clipped a kerb and collided with two parked cars – a Volkswagen Passat and a Citroen Xsara – before coming to a stop on its roof. The occupants – driver Graddon, 30, of Fitch Drive, Brighton, and her son – were treated at the scene for minor injuries. A sample of blood was then taken from Graddon, who is unemployed, which revealed she had 178mg of alcohol per 100ml of blood in her system. The legal limit is 80mg. She was arrested and charged to appear at Brighton Magistrates’ Court on 21 September, where she pleaded guilty and was disqualified from driving for 20 months. She was also sentenced to a six-month community order, and ordered to pay a £120 fine, £85 costs and a £85 victim surcharge.